Europe relies heavily on natural resources ( A ) to fuel its economic development. Past and current production and consumption patterns have underpinned substantial growth in wealth across Europe. However, concerns about the sustainability of these patterns are mounting, particularly regarding the implications related to resource use and over-use. The assessment of natural resources and waste in this chapter complements the assessment of biotic natural resources in the previous chapter by focusing on material, and often non-renewable, resources as well as water resources. A life-cycle perspective on natural resources addresses several environmental concerns related to production and consumption, and ties together the use of resources and the generation of waste. While both resource use and waste generation have distinct environmental impacts, the two issues share many of the same driving forces — largely related to how and where we produce and consume goods, and how we use natural capital to sustain economic development and consumption patterns. 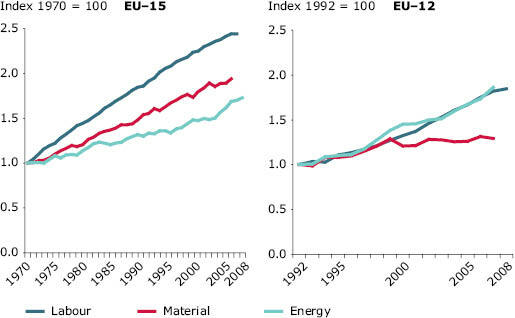 In Europe, resource use and waste generation continue to rise. However, there are considerable national differences in per person resource use and waste generation, driven mainly by varying social and economic conditions as well as different levels of environmental awareness. While resource extraction within Europe has been stable over the past decade, dependence on imports is increasing ( 1 ). Environmental problems associated with the extraction and processing of many materials and natural resources are shifting from Europe to the respective exporting countries. Consequently, the impacts of consumption and resource use from Europe on the global environment are increasing. As resource use in Europe exceeds local availability, Europe’s dependence on and competition for resources from elsewhere in the world raises questions about security in the supply of resources for Europe in the long term, and carries a potential for future conflicts ( 2 ). Source: EEA, ETC Sustainable Consumption and Production. Waste management has been a focus of EU environmental policies since the 1970s. Such policies, which increasingly require the reduction, reuse and recycling of waste, are contributing to closing the loop of material use throughout the economy by providing waste-derived materials as inputs for production. More recently, life-cycle thinking has been introduced as a guiding principle of resource management. Environmental impacts are considered across the whole life cycle of products and services to avoid or minimise shifting the environmental burden between different phases of the life cycle and from one country to another — using market-based instruments where possible. Life-cycle thinking affects not only environmental, but also most sectoral policies — by making use of materials and energy from waste, decreasing emissions, and re-using already developed land. The EU brings together waste and resource use policies through the Thematic Strategy on the prevention and recycling of waste ( 3 ) and the Thematic Strategy on the sustainable use of natural resources ( 4 ). Furthermore, the EU has set itself a strategic goal of moving towards more sustainable patterns of consumption and production, with a view to decoupling resource use and waste generation from the associated negative environmental impacts and becoming the world’s most resource-efficient economy (6th EAP) ( 5 ). In addition, water as a renewable natural resource is covered by the Water Framework Directive ( 6 ) which aims to ensure the provision of sufficient supply of good quality surface water and groundwater as needed for sustainable, balanced and equitable water use. In addition, broader considerations of water scarcity in the context of sustainable consumption and production and climate change, as well as strengthening demand management require a better information base and further policy development. Note: Domestic material consumption (DMC) is an aggregate of materials (excluding water and air) which are actually consumed by a national economy: used domestic extraction and physical imports (mass weight of imported goods) minus exports (mass weight of exported goods). Any society with a history of rapid growth of industry and consumption faces the issue of sustainable waste management, and for Europe, this issue continues to raise considerable concerns. The EU is committed to reducing waste generation, but is not succeeding. Trends for those waste streams for which data are available indicate the need to reduce the generation of waste in absolute terms to ensure further reduction of environmental impacts. In 2006, EU-27 Member States produced some 3 billion tonnes of waste — an average of 6 tonnes per person. There are substantial differences in waste generation between countries, up to a factor of 39 between EUMember States, largely due to different industrial and socio-economic structures. 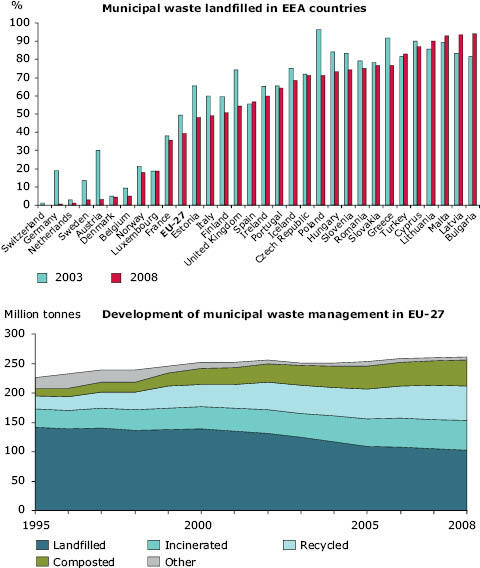 Similarly, municipal waste generation per person varies by a factor of 2.6 between countries, amounting to 524 kg per person in 2008 on average in EU-27 Member States. It has increased between 2003 and 2008 in 27 out of 35 countries analysed. However, the growth of municipal waste generation in EU-27 has been slower than that of GDP, thus achieving relative decoupling for this waste stream. The growth in waste volumes were driven mainly by household consumption and increasing number of households. Waste generation from construction and demolition activities has increased, as has packaging waste. There is no time-series data for waste electric and electronic equipment; however, recent projections show this to be one of the fastest-growing waste streams ( 7 ). Volumes of hazardous waste, which amounted to 3% of total waste generation in EU-27 in 2006 ( 8 ), are also increasing in the EU and remain a key challenge. Sewage sludge generation is increasing as well, mostly linked to implementation of the Urban Waste Water Treatment Directive( 9 ). This raises concerns about its disposal (and the effects on food production where agricultural land is used). Also, marine litter ( B ) is an area of increased concern for European seas ( 10 ) ( 11 ) ( 12 ): the management of its impacts has been included in the Marine Strategy Framework Directive ( 13 ) and in regional sea conventions. Furthermore, it is worth noting that there are some specific waste-related challenges in Western Balkan countries related to past practices, such as unmanaged waste from mining, oil processing, chemical and cement industries, and the consequences of conflicts in the early 1990s ( 14 ). Meanwhile, waste management has improved in almost all EUMember States, as more waste is being recycled and less landfilled. Nevertheless, still about half of the 3 billion tonnes of total waste generated in the EU-27 in 2006 was landfilled. The rest was recovered, recycled and reused, or incinerated. Good waste management reduces environmental impacts and offers economic opportunities. It has been estimated that roughly 0.75% of EU GDP corresponds to waste management and recycling ( 15 ). The recycling sector has an estimated turnover of EUR 24 billion and employs about half a million persons. Thus, the EU has around 30% of world share of eco-industries and 50% of the waste and recycling industries ( 16 ). Waste is increasingly traded across borders, much of it for recycling, or material and energy recovery. This development is driven by EUpolicies requiring minimum recycling rates for selected waste streams as well as by economic forces: for more than a decade the prices of raw materials have been high or increasing, making waste materials an increasingly valuable resource. At the same time, export of used goods (for example, used cars) and their subsequent unsuitable waste treatment (for example, land-filling) in the receiving countries can contribute to a considerable loss of resources( C ). Hazardous and other problematic wastes are also increasingly being shipped across borders. Exports increased by almost a factor of four between 1997 and 2005. The vast majority of this waste is transported between EU Member States. Movements are driven by the availability of hazardous waste treatment capacities in countries; by different environmental standards between countries; and by different costs. Meanwhile, the increase in illegal shipments of waste, for example, from electric and electronic equipment, is a trend that needs to be curbed. Overall, the environmental effects of the growing trade in waste need to be examined more closely from a wide range of angles. European waste management builds on the principles of a waste hierarchy: preventing waste; reusing products; recycling; recovering, including energy through incineration; and finally disposal. Waste is therefore increasingly also seen as a production resource and a source of energy. However, depending on regional and local conditions, these different waste management activities may have differing environmental impacts. Although the impacts of waste treatment on the environment have been considerably reduced, there is still potential for further improvement, first by full implementation of existing regulations, and then through the extension of existing waste policies to encourage sustainable consumption and production practices including more efficient resource use. Waste policies can primarily reduce three types of environmental pressures: emissions from waste treatment installations such as methane from landfills; impacts from primary raw materials extraction; and air pollution and greenhouse gas emissions from energy use in production processes. Although recycling processes themselves also have environmental impacts, in most cases the overall impacts avoided by recycling and recovery are greater than those incurred in the recycling processes ( 17 ). Waste prevention can help reduce environmental impacts during all stages of the life-cycle of resources. Although prevention has the highest potential to reduce environmental pressures, policies to reduce waste generation have been sparse and often not very effective. For example, there has been an emphasis on diverting biowaste, including food waste ( D ) ( E ) ( 18 ) from landfills. But more might be achieved by addressing the whole food production and consumption chain to prevent waste, thus also contributing to sustainable resource use, protection of soil and mitigating climate change. Waste recycling (and waste prevention) is closely linked to material use. On average, 16 tonnes of materials are used annually per person in the EU, much of which is sooner or later turned into waste: of the 6tonnes of total waste generated annually per person, around 33% is from construction and demolition activities, about 25% from mining and quarrying, 13% from manufacturing and 8% from households. However, direct links between resource use and waste generation are difficult to quantify with current indicators due to methodological differences in accounting for them and a lack of long-term time-series data. Note: Domestic material consumption (DMC) is an aggregate of materials (excluding water and air) which are actually consumed by a national economy. It includes used domestic extraction and physical imports (mass weight of imported goods) minus exports (mass weight of exported goods). The increases in overall resource use and waste generation in Europe are closely linked to economic growth and increasing affluence. In absolute terms, Europe is using more and more resources. 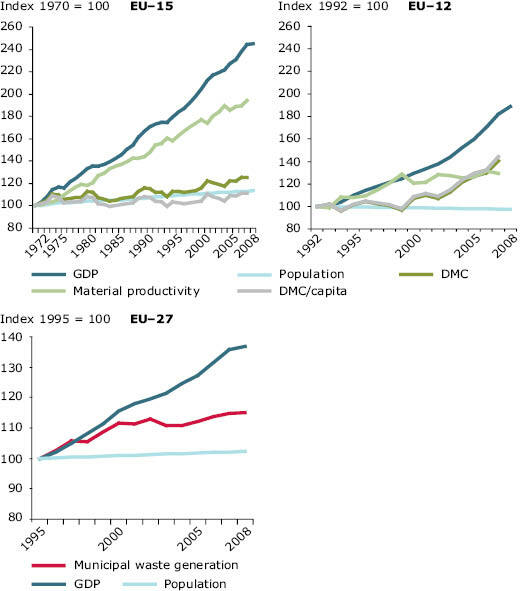 For example, resource use increased by 34% between 2000 and 2007 in the EU-12. This continues to have considerable environmental and economic consequences. 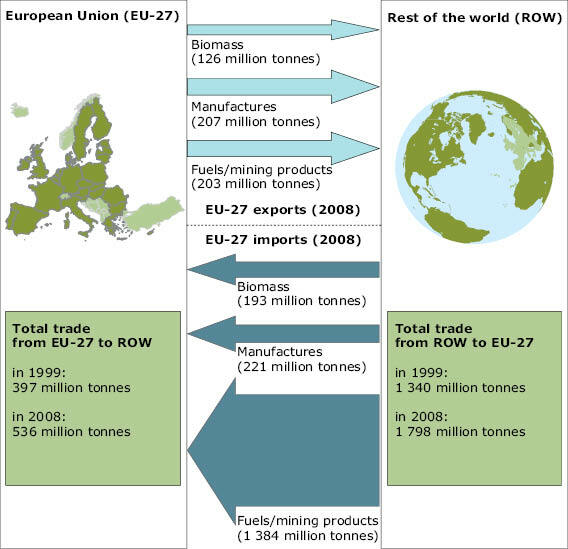 Of 8.2 billion tonnes of materials used in the EU-27 in 2007, minerals and including metals accounted for more than half, and fossil fuels and biomass for about a quarter each. The resource use category which increased most between 1992 and 2005 was that of minerals for construction and industrial use. Differences between individual countries are significant: the use of resources per person varies by a factor of almost ten between the highest and the lowest numbers. Factors that determine resource use per person include climate, population density, infrastructure, availability of resources, level of economic development, and the structure of the economy. Although the level of extraction of resources within Europe has remained stable, and in some cases has even decreased — some unmanaged burdens from past extraction persist related to mining closures. As Europe uses up reserves that are easy to access, it will have to rely more on less concentrated ores, less accessible resources and fossil fuels with lower energy content, which are expected to cause higher environmental impacts per unit of material or energy produced. The high use of resources to fuel economic growth increases the problems of ensuring supplies and sustainable yields, and managing the environmental impacts in relation to ecosystems’ absorption capacities. A challenge for both policy and science is how best to measure environmental impacts that result from resource use; several current initiatives aim to better quantify the environmental impacts of resource use. Several initiatives aim to better quantify the impacts of resource use and progress with decoupling (for example, the decoupling of economic growth from resource use and the decoupling of economic growth from environmental degradation). Domestic material consumption (DMC) is often used as a proxy for the environmental pressures of resource use. DMC measures resources directly consumed within a national economy, with an understanding that eventually each tonne of material entering an economy will come out as waste or emissions. However, such a mass-based approach does not address the large differences in environmental impacts between different materials. The environmentally-weighted material consumption (EMC) indicator attempts to combine information on material flows with information on environmental pressures for specific categories including abiotic resource depletion, land use, global warming, ozone layer depletion, human toxicity, terrestrial ecotoxicity, aquatic ecotoxicity, photochemical smog formation, acidification, eutrophication, and radiation. However, the EMC also focuses on environmental pressures and thus only provides a proxy for related impacts. The national accounts matrix extended by environmental accounts (NAMEA) approach aims to take the assessment of environmental pressures further by also including environmental pressures ‘embedded’ in traded goods and services. Thus the results of the traditional materials accounting and NAMEA approach may be quite different. This difference can be illustrated by looking at greenhouse gas emissions: while traditional accounting for national emissions is based on a territorial perspective, the NAMEA approach aims to include all emissions induced by a nation’s consumption. In addition to the above, a basket of indicators or accounting approaches has been identified which aim to monitor environmental impacts from resource use. These includes the ecological footprint (EF) which compares human demand with planet Earth’s ecological capacity to regenerate, human appropriation of net primary production (HANPP), land and ecosystem accounts (LEAC) ( b ). European economies are creating more and more wealth from the resources that we use. Resource efficiency in Europe has improved over the past two decades through the use of more eco-efficient technologies, the transition to service-based economies and an increased share of imports in EU economies. However, differences in resource efficiency across Europe are substantial, with a factor of almost ten between the most and least resource-efficient EU economies. 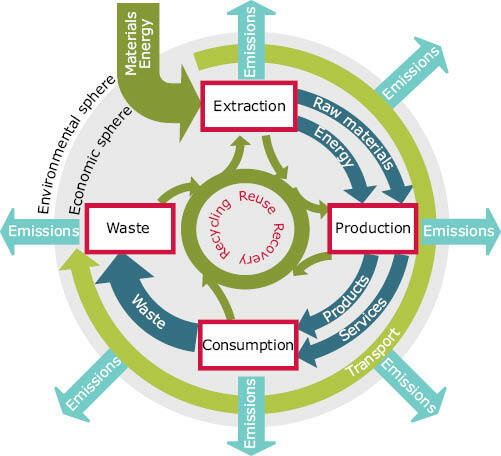 Factors that affect resource efficiency include the technological level of production and consumption; the share of services versus heavy industry; regulatory and tax systems; and the share of imports in total resource use. The magnitude of the differences between countries points to significant potential for improvement. 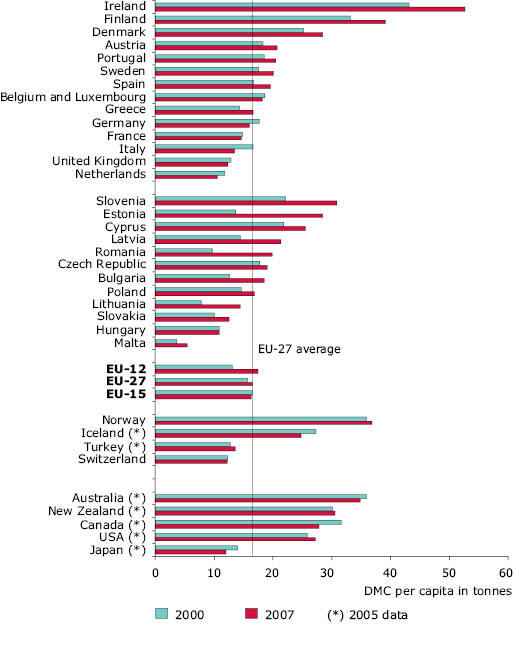 For example, resource efficiency in EU-12 is only about 45% of that in the EU-15. The ratio has changed little over the past two decades, and efficiency improvements in the EU-12 were mostly recorded before 2000. Indeed, the growth in the productivity of resources over the past forty years has been significantly slower than that in the productivity of labour and in some cases of energy. While some of this is a result of the restructuring of economies, with a growing share of services, it also reflects the fact that labour has become relatively more costly compared with energy and materials, partly as a result of prevailing tax regimes. Addressing resource productivity and energy efficiency, substituting non-renewable with renewable resources, and addressing resource efficiency gaps between EU-15 and EU-12 Member States can provide opportunities for increasing European competitiveness. Water resource management differs from the management of other resources due to the unique characteristics of water as a resource: water moves through the hydrological cycle, is dependent on climatic influences, and its availability varies in time and space. It also connects different regions and other environmental media. Water is the basis for many ecosystem services — such as transport, energy provision, cleaning — but can also transfer impacts from one environmental medium or one region to another. This poses explicit needs for integration and cross-border cooperation. Human demand for water is in direct competition with the water needed for maintaining ecological functions. In many locations in Europe, water used by agriculture, industry, public water supply and tourism put considerable stress on Europe’s water resources, and demand often exceeds local availability — and this is likely to be further exacerbated by climate change impacts. Note: WEI: annual total water abstraction as a percentage of available long-term freshwater resources. The warning threshold, which distinguishes a non-stressed from a water scarce region, is around 20%, with severe scarcity occurring where the WEI exceeds 40%. Water resources and the demand for water by different economic sectors are unevenly distributed across Europe. Even if water is abundant on a national scale, it may be scarce in individual river basins during different time periods or seasons. In particular river basins in the Mediterranean region, but occasionally also some northern regions, experience over-abstraction. The main reasons for over-abstraction include increasing demand for irrigation and tourism. In addition, considerable ‘loss’ of water can occur in public distribution and supply networks prior to it reaching consumers, thus aggravating shortages in already water scarce regions. In some countries this loss in the supply network may be up to 40% of the total water supply in others it is below 10% ( 19 ). A combination of economic and natural factors results in major regional differences in water use. Water use is stable in southern Europe and, decreasing in western Europe. This decrease is attributed mostly to behavioural changes, technological improvements and the prevention of water losses in distribution systems, supported by water pricing. Eastern Europe has experienced substantial decreases in water use — the average annual water use in the period 1997 to 2005 was around 40% lower than in the early 1990s — mainly as a result of the introduction of water meters, higher water prices, and the closure of some water-intensive industries ( 19 ). In the past, European water management has largely focused on increasing supply by drilling new wells, constructing dams and reservoirs, investing in desalination and large-scale water-transfer infrastructures. Increasing problems of water scarcity and drought clearly indicate the need for a more sustainable management approach. There is a particular need to invest in demand management that increases the efficiency of water use. Greater water efficiency is possible. For example, there are large but currently unrealised potentials for water metering and the reuse of wastewater ( 19 ). Reuse of wastewater has been proved internationally, in water-stressed regions, to be a drought-proof source of water and one of the most effective solutions to water scarcity. In Europe, wastewater is reused mainly in southern Europe. Provided that the quality is thoroughly controlled, the benefits can be substantial, including increased availability of water, reduced nutrient discharges, and reduced manufacturing costs for industry. Not least, land use practices and development planning could have a major impact on water scarcity, through parallel, compatible considerations of the use of groundwater and surface water. Intensive exploitation of aquifers can give rise to over-exploitation, such as that related to excessive abstraction for irrigation. The resulting short-term increase in productivity and change in land use impacts further exacerbates groundwater exploitation and can establish a cycle of unsustainable socio-economic developments — including risk of poverty, social distress, energy and food security ( 20 ). Land-use practices can also cause significant hydro-morphological alterations with potential adverse ecological consequences. For example, many important wetlands, forests and floodplains in Europe have been drained and dammed, regulations and channels have been constructed to support urbanisation, agriculture, energy demand and protection from floods. The issues of water quantity and quality, irrigation water demand, water-use conflicts, environmental and socioeconomic aspects and risk management aspects can be better integrated in the institutional and political systems. The Water Framework Directive (WFD) provides a framework to integrate high environmental standards for water quality and use into other policies ( 6 ). A first look at river basin management plans, which have been set up and reported by Member States during the first round of implementation of the WFD, indicates that a significant number of water bodies face a high risk of not achieving good ecological status by 2015. In many cases, this is due to issues related to water management, particularly linked to water quantity and irrigation, modifications of the structure of river-banks and river-beds, the connectivity of rivers or unsustainable flood protection measures which have not been addressed by earlier, pollution-oriented policies. The overall challenge which the WFD can help tackle, if implemented fully, is to ensure the sustainable availability of good water quality, as well as managing inevitable trade-offs between competing uses, such as domestic use, industry, agriculture and the environment (see also Chapter 6). The use of resources, water, energy and the generation of waste are all driven by our patterns of consumption and production. The majority of greenhouse gas emissions, acidifying substances, tropospheric ozone precursor emissions and material input caused by the life-cycles of activities related to consumption can be allocated to the main consumption areas of eating and drinking, housing and infrastructures, and mobility. Within nine countries analysed ( F ), these three consumption areas contributed 68% of greenhouse gas emissions, 73% of acidifying emissions, 69% of tropospheric ozone precursor emissions and 64% of direct and indirect material input, including use of domestic and imported resources in 2005. 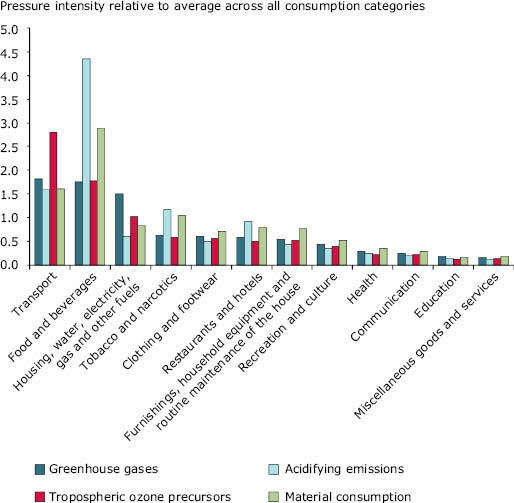 Eating and drinking, mobility, and to a lesser extent housing, are also the areas of household consumption with the highest pressure intensities, which indicates the largest environmental pressures per Euro spent. Reductions in environmental pressures caused by household consumption could be achieved by reducing the pressure intensities within individual consumption categories — for example, through improvements in housing energy efficiency; by switching transport expenditure from private cars to public transport; or by shifting household expenditure from a pressure-intensive category (such as transport) to a low intensity one (such as communication). European policy has only recently begun to address the challenge of the growing use of resources and unsustainable consumption patterns. European policies, such as the Integrated Product Policy ( 21 ) and Directive on Eco-design ( 22 ) focused on reducing the environmental impacts of products, including their energy consumption, throughout their entire life-cycle: it is estimated that over 80% of all product-related environmental impacts are determined during the design phase of a product. In addition, EUpolicies also stimulate innovation-friendly markets with the EULead Markets initiative ( 23 ). The 2008 EU Action Plan on Sustainable Consumption and Production and Sustainable Industrial Policies ( 24 ) reinforces life-cycle approaches. In addition, it strengthens green public procurement and initiates some actions to address consumer behaviour. However, current policies do not sufficiently address the underlying causes of unsustainable consumption, tend to focus instead on reducing impacts, and are often based on voluntary instruments. 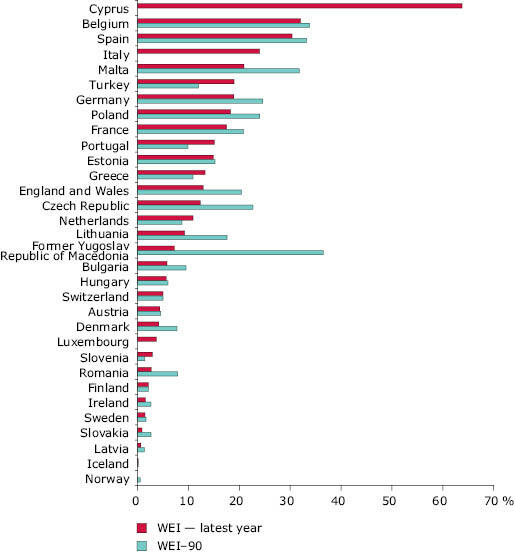 Source: EEA, ETC Sustainable Consumption and Production (based on Eurostat). Overall, much of the EU resource base is now located abroad — more than 20% of resources used in Europe are imported ( 25 ) ( 26 ). This import reliance is particular apparent with regard to fuels and mining products. A side-effect of this trade balance is that some of the environmental impacts of European consumption are felt by the exporting countries and regions. Europe is, for example, a net importer of fodder and cereals for European meat and dairy production. Also, more than half of EU fish supplies are imported: the 4 million tonne gap between fish demand and supply in Europe is being made up through aquaculture and imports ( 27 ). This increasingly raises concerns about the impacts on fish stocks, as well as other environmental impacts related to food production and consumption (Chapter3). For many materials and trade goods, the environmental pressures related to their extraction and/or production — such as the waste generated, or water and energy used — affect the countries of origin. However, even though these pressures can be significant, they are not captured in indicators commonly used today. For some products, for example computers or mobile phones, those pressures may be several orders of magnitude higher than the actual weight of the product itself. Another example for the use of natural resources embedded in traded products is the water required in growing regions for many food and fibre products. Their production results in an indirect and often implicit export of water resources: for example, 84% of the EUcotton-related water footprint, which is a measure for the total amount of water used to produce goods and services consumed — lies outside the EU, mostly in water-scarce region with intensive irrigation( 28 ). Trade-related environmental impacts may be further aggravated by lower social and environmental standards in some exportingcountries, especially compared to those in the EU. However, globalisation and trade also enable resource-rich countries to export resources and raise revenues. If managed properly, for example by offering dedicated incentives, the benefits can increase the environmental efficiency of both exports and imports by enhancing green export competitiveness and reducing embedded environmental pressures in imports. The direct environmental impacts of resource use include the degradation of fertile land, water shortages, waste generation, toxic pollution, and biodiversity loss in terrestrial and freshwater ecosystems. In addition, indirect environmental impacts, for example related to land-cover changes, may have considerable effects on ecosystem services and health. Climate change is expected to increase environmental pressures related to resource use as changing precipitation patterns in the Mediterranean, for example, put additional pressure on water resources and influence land-cover changes. Most environmental pressures assessed in this report are driven — directly or indirectly — by the increasing use of natural resources for production and consumption patterns that leave an environmental footprint in Europe and elsewhere in the world. Furthermore, the related depletion of our stocks of natural capital and its links to other forms of capital is putting at risk the sustainability of Europe’s economy and social cohesion. For references, please go to https://www.eea.europa.eu/soer/synthesis/synthesis/chapter4.xhtml or scan the QR code.